Candidates with Union President Amy McDermott (centre), and Dean for Student Affairs Dr Tim Whalley (far left), prior to the hustings. Students at the University of Stirling have been getting to the heart of key General Election issues, at a special hustings with all five candidates for the Stirling constituency. 'Stirling Question Time', organised by the Students’ Union, was the first all-candidate local hustings of the 2015 campaign. Former MP Anne McGuire is not re-standing for election. The prospective MPs were quizzed on topics including zero-hour contracts, the rental sector and postgraduate funding. Union President Amy McDermott introduced the candidates, with the event then chaired by Craig Docherty of Air3 Radio, Heather Marr, of the Politics Society, and Joe Deans, of the Debating Society. Amy said: "Students at Stirling are a vital part of the constituency make-up, so we were delighted to host a five-way candidates’ question and answer event where they could speak directly with the people who seek to represent them. "Students’ voices are crucial, and it was a great platform to empower our students to tell the candidates their demands and generate an energy to get out and vote! "It was fantastic to have such a high turnout, which shows how engaged our students are with the political debate. "The Union is encouraging all students eligible to vote on 7 May to register by the deadline of Monday, 20 April and ensure that they get to the polling stations on the day." Amy (centre) is pictured with, L-R: Dr Tim Whalley, the University’s Dean for Student Affairs; Johanna Boyd, Labour Party; Steven Paterson, SNP; Mark Ruskell, Green Party; Elizabeth Wilson, Liberal Democrats; Stephen Kerr, Conservatives. 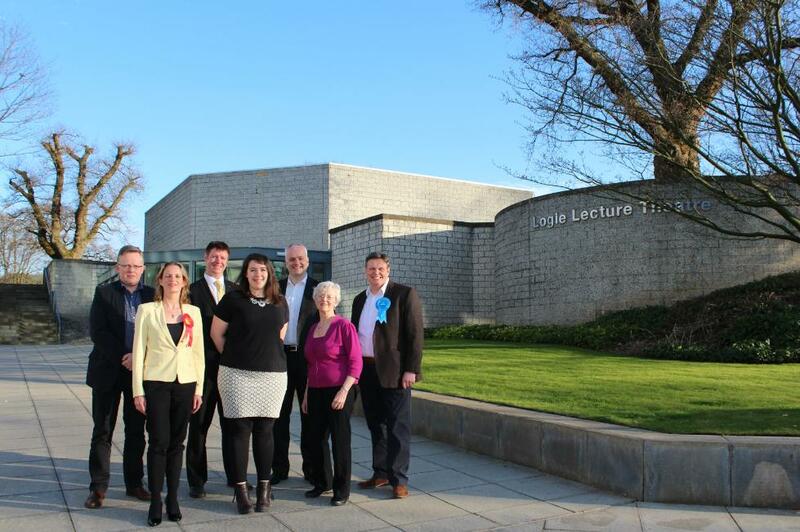 Photo titled Stirling Question Time shows, prior to the event on campus, L-R: Dr Tim Whalley, the University’s Dean for Student Affairs; Johanna Boyd, Labour Party; Steven Paterson, SNP; Union President Amy McDermott; Mark Ruskell, Green Party; Elizabeth Wilson, Liberal Democrats; Stephen Kerr, Conservatives.